Brad Paradis with his winning fish. OGDENSBURG -- The NNY Bassmasters Federated Club held their first event of 2017 out of Ogdensburg on the St. Lawrence River recently. 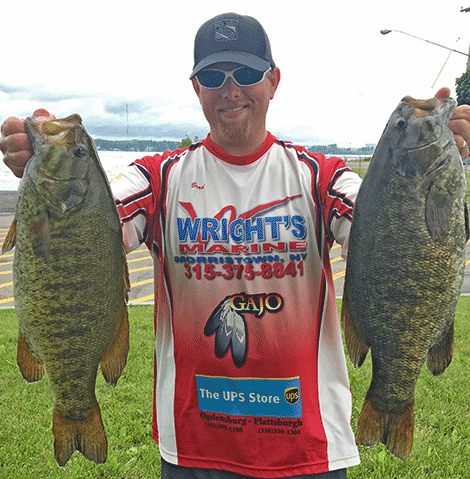 Brad Paradis of Ogdensburg finished in first place at the event and took lunker for the day. His bag of five smallmouth weighed 23.47 lbs. anchored by a 5.40 lb. smallmouth. Rounding out the top three were Jesse Spellicy of Gouverneur in second place with 20.79 lbs. and Corey Palmer of Ogdensburg in third place with 19.88 lbs.